SOLD!!! THANK YOU CARPROPERTY.COM FOR BRINGING US SOOOO MUCH INTEREST FROM POTENTIAL BUYERS!! 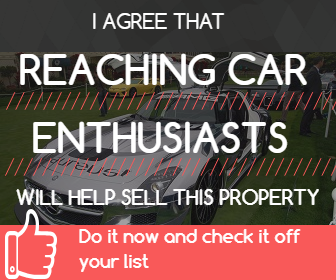 WE HIGHLY RECOMMEND YOU FOR ANYBODY WHO WANTS TO SELL OR RENT THEIR CARPROPERTY. 80 car showroom and 5 car garage, Enter 2.5 acres, 8x8x16 stucco walled compound through two 30 ft steel remote gates with 18,000 SF paver driveway. Cantera Stone Entry w/15,000 sq.ft. under roof, RV parking; home has 4bedrooms and 3bathrooms, Travertine tile, 2 - fireplaces, game room with brick ceiling, Tiger Bamboo floors; backyard offers 3-guest bungalows/bathroom. Opens to a 40,000 gallon solar heated Pebbeltec pool w/slide/water feature and heated spa. Built-in barbeque/buffet area, 4 built-in refrigerators, custom Palapa bar that seats 15 surrounded by over $200,000 in landscaping, 65+ palm trees. Gourmet kitchen, granite with 8 burner gas cook top and top of the line appliances. No HOA, paved road, 20 minutes to Barrett Jackson and Lake Pleasant; 45 minutes to PIR/NASCAR track. Low AZ real estate taxes; $4300 a year! 11/07/2012 Great Buy when it sold in July 2012!! 04/23/2012 Great property for a concept I have in mind. Very well done! Waiting to hear back from the contact form I filled out.